Last Friday, I was honored with an invitation by Christina Chely of the Finger Lakes Wine Country Tourism Marketing Association, Inc. to attend a recent Riedel Glass Workshop with 10th generation glassmaker and owner of Riedel Crystal, Georg Riedel, for a comparative wine glass tasting that included three world class Finger Lakes Rieslings. As you can see from the clip, Mr. Riedel is charming and funny and was quick to share his thoughts on the Finger Lakes Wine Region and his affection for it and the people found here. He told our group that he came to the Finger Lakes for the first time in March of this year and fell in love with the people and the region and considers the Finger Lakes an emerging wine region. Although there were many skeptics as to the importance of a wine glass to wine enjoyment, the attendees I spoke to at the event were convinced of the subtle enhancements of distinct characteristics of the wines we tasted by glasses of different shapes and sizes. Among the key points that Mr. Riedel taught us, he emphasized that when buying wine glasses, you should never buy them on aesthetics alone. He insists that you taste wine with them first. As Georg walked us through the tasting, some glasses brought out a wine’s minerality, bitter components, acidity, warmth, fruit and complexity. We were asked to vote on our favorite glasses for each of three Finger Lakes Rieslings from Knapp Winery, Glenora Wine Cellars and Sheldrake Point Vineyard in a horizontal tasting, meaning that the same wine was tasted from seven different Riedel glasses and then the next wine was tasted across all seven glasses. The result was that there were two distinct favorites, the #454/05 and #446/15 for the Rieslings that we tasted. But more than the educational aspect of enhancing wine appreciation via Riedel glassware, I came away with something else…a connection to Georg and his company. He was rather humble in his presentation and quick to jump in with questions to winemakers as they explained some of the complexities of the winemaking process, ever mindful of the newbies among us. Georg was hands-on and poured wine before the event, assisting his staff and taking pains to assure that the wines were ready for the event and not corked. He was quick-witted, inviting and warm in his presentation and his passion for his family’s famous glasses was palpable and much-appreciated. The wines of the Finger Lakes region continue to receive accolades this week. In an article with a political slant about Red and Blue state wines, Eric Arnold of Forbes.com turns to Tyler Colman, aka Dr. Vino, for his take on the less-heralded red and blue wine states outside of California, Oregon and Washington. Tyler includes New York as being among the blue states often overlooked and escapes the designation of being thought of as a wine-growing hot spot. He states that Long Island wines have been developing an increased following over the last 10 years, but that in order to find “greater consistency, quality and bang for the buck, look north.” As in North to the Finger Lakes. The In-Depth slide show also touts New York as a sleeping giant in the wine industry and names Finger Lakes Rieslings as particularly good, calling out Heron Hill, Dr. Konstantin Frank, Herman J. Weimer and Fox Run as the wineries to seek out. Let’s keep these types of articles rolling. Wine event source LocalWineEvents.com has launched a video arm to its site, dubbed Video Juice. Here you will find videos in the categories of Wine, Food, Spirit and Beer. If you have videos in these categories available, you may want to consider sharing them via this site to drive traffic to your website. Speaking of videos, if you haven’t checked it out yet, Seneca Lake Wine Trail has videos posted to YouTube.com at http://www.youtube.com/user/SenecaLakeWineTrail. If you create your own profile with YouTube, you can subscribe to Seneca Lake Wine Trail’s videos as well as other channels of interest for updates of new videos. As you know, video is a tremendous avenue for getting the message out about your winery, your winery’s story, what makes you different and offers a direct avenue for you to speak directly to consumers. I recently received some great advice from Morgen McLaughlin, President of Finger Lakes Wine Country Tourism Marketing Association, Inc. This new feature is just one of the many ideas that Morgen suggested to me. I will feature a round-up of interesting items from the week and welcome your input, as always! After our lunch, I came away thoroughly impressed with her vision for the Finger Lakes Wine Industry and her dedication to pushing the envelope with forward-thinking strategies to bring the region to new levels, ultimately driving new tourists to our tasting rooms. Thanks so much, Morgen! From what I understand, a majority Finger Lakes wine sales are generated directly in the tasting room. Are Wine Enthusiast and Wine Spectator ratings and wine competition medal wins as relevant to those visitors and core enthusiasts of the region? Or is the personal connection and nostalgia of a trip established in the tasting room during wine trailing ventures more of a factor? My take on the debate is that for those wineries looking to widen their distributorship and availability in out-of-state retail stores and via online wine sales, the scores are extremely important because they provide a benchmark and reference point for decision makers while each wine is struggling to gain attention in a sea of available wines. In order to attain scores in the 90’s, it sounds like Joe is looking for more consistency from our vintages, a challenge especially with the unpredictable growing conditions present here in New York. But with an influx of talented and visionary winemakers, surely we’re making great strides in our quest to further establish the Finger Lakes and other wine regions of New York as among the world’s best. For wineries who are very happy with direct sales via their tasting rooms and wine clubs, scores and medals may provide a helpful guide for winery visitors, but ultimately individual consumer palates and ties to the region may win out and drive their buying patterns. Keep an eye on Joe’s post for other responses to this debate. Wine&SpiritsCover.jpg, originally uploaded by MelissaADobson. Wine & Spirits Magazine has just published a special issue “Rebels Rock The Best in the World of Wine.” Inside of the New Wine Travel section, the editors compiled profiles of four key wine regions in the U.S. to drive to in order to spend 48 hours immersed in wine country, with New York’s Finger Lakes wine country front and center of the feature. 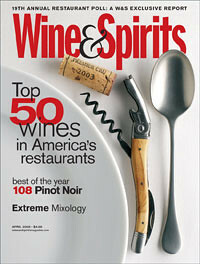 Wine & Spirits publisher and editor Joshua Greene wrote the profile and mentions that “although the legacy of sweeter styles from native and hybrid vines is what fills the local tasting rooms…recently the crowds seeking out dry wines based in vinifera vines have arrived in force.” He also touts the region’s great Riesling, Gewürztraminer, Pinot Gris, Pinot Noir and Cabernet Franc. Another compliment is his comparison of the Finger Lakes region to the region of Alsace. I like this comparison because I feel that it helps to elevate the image of the region and its wines, and may even tempt lovers of Alsatian wine to give the American versions found here a try. Positioning the Finger Lakes wines as great locally-produced, better-valued alternatives could be a key selling point to the skeptical wine connoisseurs in New York City and other major metropolitan areas who tend to look to key publications such as Wine & Spirits Magazine for recommendations and affirmation of a region’s wine and culinary offerings.